This ended up being a really fun fight. After an extremely tight first round, Shlemenko unloaded on Rogers with some crazy offense. 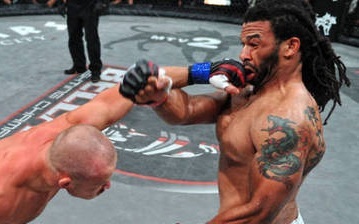 Spinning backfist, punches and kicks, and knees ended up sealing the fate of Brian Rogers. I don’t know if anyone doubts that Shlemenko is the second best middleweight in Bellator, so him potentially winning this tournament will come as no surprise to anybody. Vianna caught Baker early with some big punches and landed a number of unanswered shots with Baker pinned up against the cage. The outcome was extremely surprising and Vianna will now challenge Alexander Shlemenko for a shot at Hector Lombard’s Middleweight Title. Vianna has put together a pretty impressive resume and adding a ranked fighter like “Storm” in the finals would be a real coup. Makovsky dispatch Roberts with a nice north/south choke in the closing moments of the first round. As far as I’m concerned, a fight with Alexis Vila can’t come soon enough. Makovsky is awesome and as I noted yesterday, it’s a shame that he’s relegated to these fights against less than contenders. Whoever wins the bantamweight tournament should give Makovsky a challenge, while Vila and Marcos Galvao seem to be the likeliest opponents. Nazare bloodied Kirwan in the opening round, but Kirwan did a nice job of holding Nazare down to earn the win. It was a far from impressive performance, but a win is a win for Kirwan.